OAKLAND, Calif., April 2, 2019 /PRNewswire/ -- Scoop Away®, the clumping cat litter known for its 7-day odor control guarantee, is proud to partner with published author, movie star, talk show host, Billboard topping artist, and philanthropist, Lil BUB, and join her mission to spread positivity, acceptance, love and animal welfare awareness. To celebrate the partnership, Scoop Away® created a limited edition box featuring Lil BUB on millions of their packages. "Lil BUB was born with a rare condition called osteopetrosis, which is responsible for her small size, unique appearance and restricted mobility," said Lil BUB's owner Mike Bridavsky. "We created Lil BUB's BIG Fund for the ASPCA® – the first fund for special needs pets and the most applied for – and with Scoop Away®'s help, we are thrilled to raise awareness and additional funds for homeless pets in need." To further help special needs pets, like Lil BUB, find loving homes, Scoop Away® donated $5,000 to Lil BUB's BIG Fund for the ASPCA®. You, too, can donate at aspca.org/lilbub. 100 percent of funds collected are distributed as grants by the ASPCA® (The American Society for the Prevention of Cruelty to Animals®) to animal welfare organizations across the country to help homeless pets with special needs. "It has always been our mission to help cats find their forever homes, and that includes special needs pets, like Lil BUB," said Lauren May, Associate Director of Marketing, Clorox Pet Products. "Special needs pets are among the most challenging for shelters and rescue groups to adopt out and the most expensive to care for. We hope potential adopters see the 'special' in special needs as these animals still have plenty of love, devotion and companionship to give." Scoop Away® is also the proud sponsor of Lil BUB's Big SHOW – LIVE! debuting as the headline act at the Catsbury Park Cat Convention in Asbury Park, NJ on April 14, 2019. In her biggest show yet, the world's most beloved feline host will bring the tough questions to entertainment luminaries including comedian, actor, and musician, Fred Armisen; musician and journalist Steve Albini; lead guitarist for The Breeders, Kelley Deal, and renowned bassist Blasko. You can purchase tickets for the event at CatsburyConvention.com. 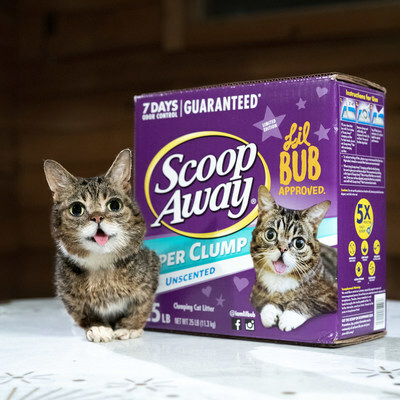 The limited edition Scoop Away® box featuring Lil BUB retails for $11.34 (25lbs.) and is available in grocery, pet, mass, dollar and drug stores nationwide beginning in April 2019, while supplies last. For more information on Scoop Away® litter and the Lil BUB partnership, visit ScoopAway.com and follow us on Facebook and Instagram at @scoopawaylitter. The Clorox Company (NYSE: CLX) is a leading multinational manufacturer and marketer of consumer and professional products with approximately 8,700 employees worldwide and fiscal year 2018 sales of $6.1 billion. Clorox markets some of the most trusted and recognized consumer brand names, including its namesake bleach and cleaning products; Liquid-Plumr® clog removers; Poett® home care products; Fresh Step® cat litter; Glad® bags, wraps and containers; Kingsford® charcoal; Hidden Valley® dressings and sauces; Brita® water-filtration products; Burt's Bees® natural personal care products; RenewLife® digestive health products; and Rainbow Light®, Natural Vitality® and Neocell® dietary supplements. The company also markets brands for its industry-leading healthcare and commercial cleaning products under the CloroxPro™ and Clorox Healthcare® names. More than 80 percent of the company's sales are generated from brands that hold the No. 1 or No. 2 market share positions in their categories.